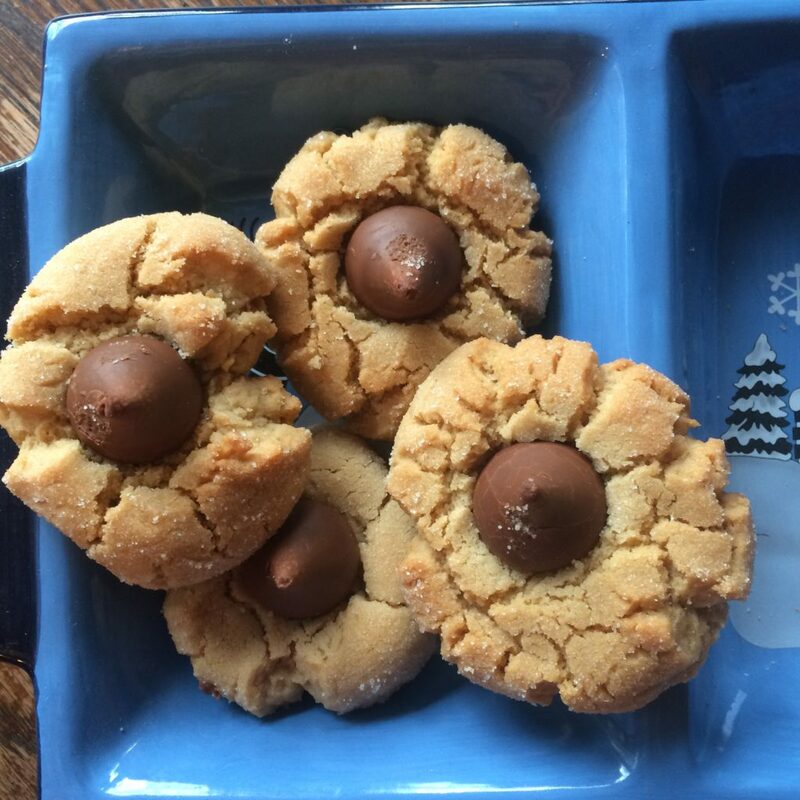 Today I will be sharing with you one of my absolutely favorite holiday cookies. I have to make these every year, usually more than once. They are “Peanut Blossoms,” but I’ve also heard them called “Peanut Butter Stars,” because there are some places where you can buy chocolate candies in the shape of stars. Alas, alack, I have never found these treasured chocolates, but Hershey’s Kisses work just as well. Don’t they look delicious? Let’s get started! Preheat the oven 350 degrees Fahrenheit. Cream together the butter and brown and white sugar. Add in the egg, vanilla, salt, and baking soda and mix well. Stir in the peanut butter, and then finally the flour. Roll the dough into small balls, and then roll them in sugar. Place them on a cookie sheet and press your thumb slightly into each ball to give it an indent. Put the dough into the oven for about six minutes (this will depend on how quickly your oven bakes things). Then place a chocolate kiss in the indentation of each cookie and bake for two minutes more. Adjust as necessary until golden brown.